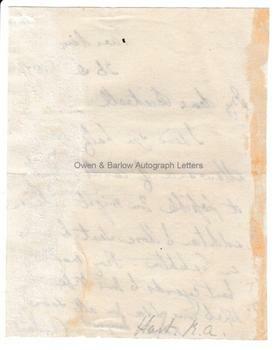 SOLOMON HART Autograph Letter Signed. Solomon Alexander Hart RA. British painter and engraver. ALS. 1p. No place. Tuesday, 26th December 1871. To "My dear Bicknell" [probably the art collector Elhanan Bicknell]. "I send you half my allowance of cards, thinking it possible you might take an addition to those sent to you as an exhibition. Pray make my best regards to your wife. I hope to come to see you all soon. In haste, yours ever, S.A. Hart." 16mo. 11 x 8.75 cms (4.5 x 3.5 inches). Lacking integral blank leaf of bifolium. Mounting traces to verso. Very good. Soloman Hart was undoubtedly the most important Jewish artist working in Britain in the 19th century. 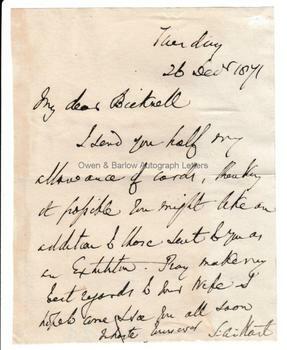 By the 1870s (the date of this letter) he was losing his eyesight but continued to paint. Provenance: From the 19th century album compiled by the family of Dr James Copland F.R.S. (1791-1870), the Scottish physician and writer on medicine.